\r\nThose are great pics between your old panel vs. your new one. One that sticks out to me though is your elevator trim. 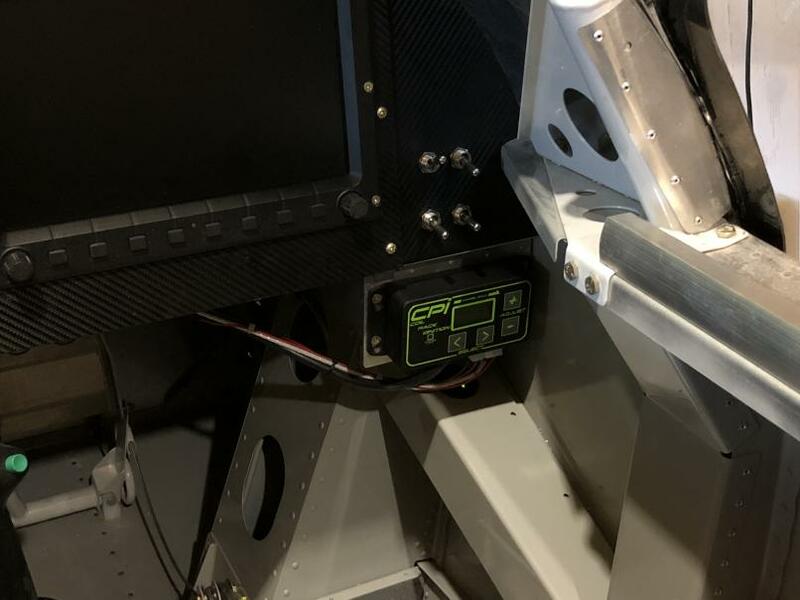 It appears you removed what looks like a manual trim wheel on the left side just below the throttle quadrant, and installed an electric trim version via a cooley switch. I did remove the manual pitch trim in favor of a coolie hat on the stick. I did not build this aircraft, the builder had installed a very nicely done pitch trim wheel below and forward of the throttle quadrant. Aileron trim was via a toggle mounted well forward of throttle quadrant. I trim a lot and found that I had to reach a little further for the wheel than was comfortable especially with shoulder harnesses tight. On top of that I was military (albeit long ago) and just used to having trim on the stick - it seems more natural to me and with the speed sensitive controller that AFS has in their board it works beautifully. Undoubtedly a personal choice but I\'m much happier with this set up, the ergonomics work well for me, it\'s more comfortable all round. I like the layout a lot. 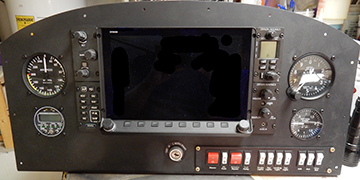 I\'ve struggled a bit with my panel plans, wanting to fit a 10" PFD, a 650-size GPS, and other stuff, but never had a layout I liked. Will have to try and incorporate this into some of my plans. \nThanks Steinair and Tom Berge! So is your back up for a screen failure an independent autopilot? Another great looking RV8 panel goes home to a happy customer! \r\n"PRINCE TRAPPED IN A PILOT\'S BODY"
Good lord....is that a placard that tells you what the buttons on the grip do? \r\nTop left of the 8 TV screens above the 29 switches below the clear plexiglas bubble thingie....how many inflight movies loaded? The local FSDO required that on my RV-10 before signing off. I did a 1”x1” printout and clear tape on the panel. Done. \r\nNo one says it has to stay there. \r\nThe 8 guys are way more humorous than the 14 guys. I screwed up. Finally got to put the driver to the screws this morning and officially install my panel. Had been waiting for the engine monitoring wire harness to be completed and now all the back-panel wiring is done and secured! (cable on the left side is a LAN cable that connects the VPX to a laptop for programming. It stays attached and stows underneath when not in use). \r\nSDS iginition CPi swings down on the right if needed. Not completely invisible when in the \'UP\' position, but certainly not an eyesore either. Once all the programming is done, I\'ll tie its wire bundle up more out of the way. Looks great! What material did you use for panel finishing? It’s 3M 1080 series carbon fiber wrap. Pretty thick stuff with a realistic texture to it. I used the additional adhesive over the entire panel and really like how well it stuck and trimmed. It didn’t get twisted and turn by the screws which was a concern I had. It’s a little pricy, but the 3’,4’ sheet I bought could probably do the whole thing all over again if it gets messed up at some point in the future. \nStarting to remove the center panel on my -8 to do a carbon fiber layup. Was going to send to Stein to have them use real carbon fiber ($$$). When I did the carbon fiber tape wrap on the RV-4 panel I had trouble with the screws puckering the tape. Took some time to get it all straightened out. I was using the 3M Dinoc wrap but I got a roll of the 1080 tape this time. \nSo you didn\'t have any issues with the screws puckering the tape at all? Did you do something special or let the tape sit on the panel for a while? Does it harden a bit if you leave it for a while? \r\n"Sure is nice to have smart friends"
Hi all. 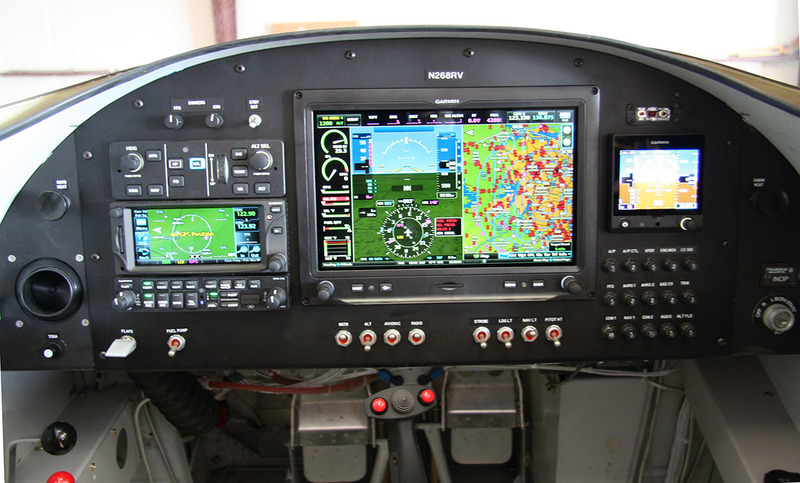 I am trying to find one or two of you building or have built and RV-8, and with ALL Garmin suite of avionics. I need to install wiring in the aft fuselage and place some components there too. Looking for " What I should Do", or better yet, "I would Do It This Way IF Had To Again". \r\nI want to minimize adding excessive weight but building all these shelfs and racks or what not. \r\nNeed to place the ELT, and I guess the 2-EarthX Batteries I decided to go with, and the Garmin Remote Transponder. Oh and the 4th and last item I guess is the GMU Magnometer. \r\nHaving a hard time finding photos or advice...all Garmin related at least. \r\nQB Fuselage started - Sep 2018 - still in it March 2019. \r\nAvionics Panel arrived! - Jan 2019. Beautiful job by the excellent Co. in Billings MT! 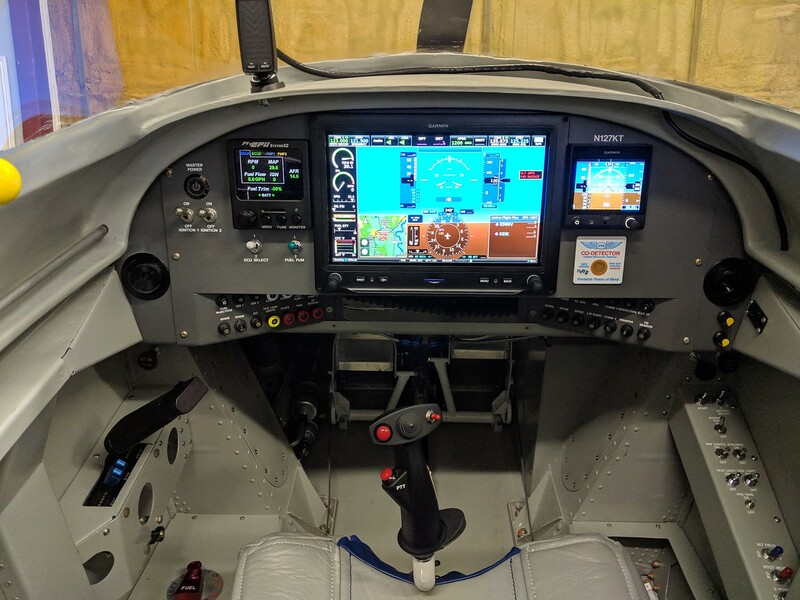 \r\nSetting avionics finally - April 2019. \r\nEngine coming soon! by May. 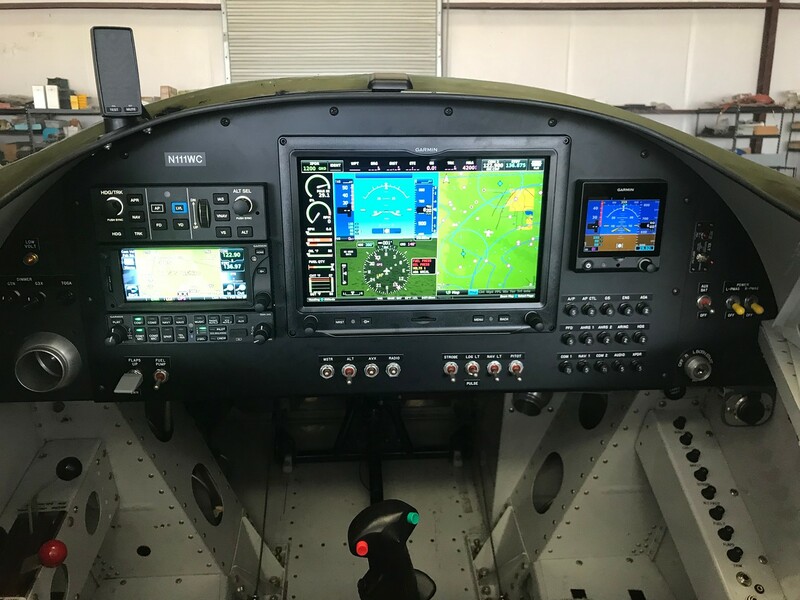 All G3X / Garmin panel. 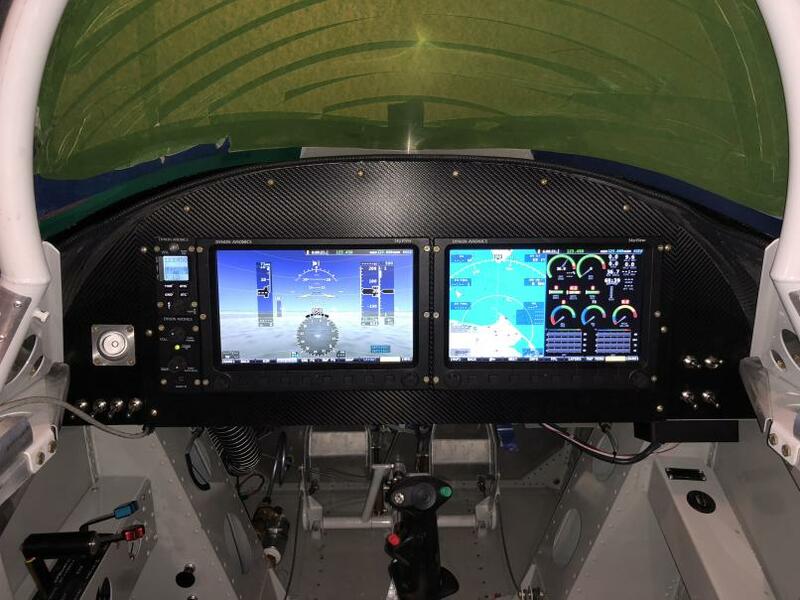 Mag mounted in left wing tip, remote transponder and radio and gdl39r mounted behind panel on a shelf. GPS20A and elt in tail. Since I retrofitted the plane, the wiring isn\'t as neat as Id like, and Id probably not do the VP-X only because Ive run out of circuits. 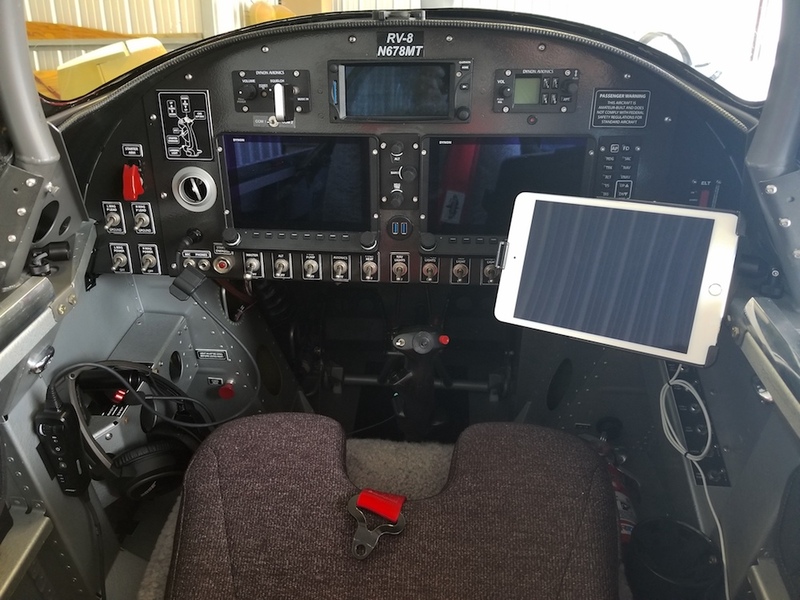 I\'ve been flying with the System32 since day 1 but had a temporary panel plate with check engine lights and the fuel trim knob. \r\nI love the panel setup. It’s obvious you have a Showplanes FB canopy kit. I especially like the taller offset stick. The offset lower IP cutout obviously accommodates this. 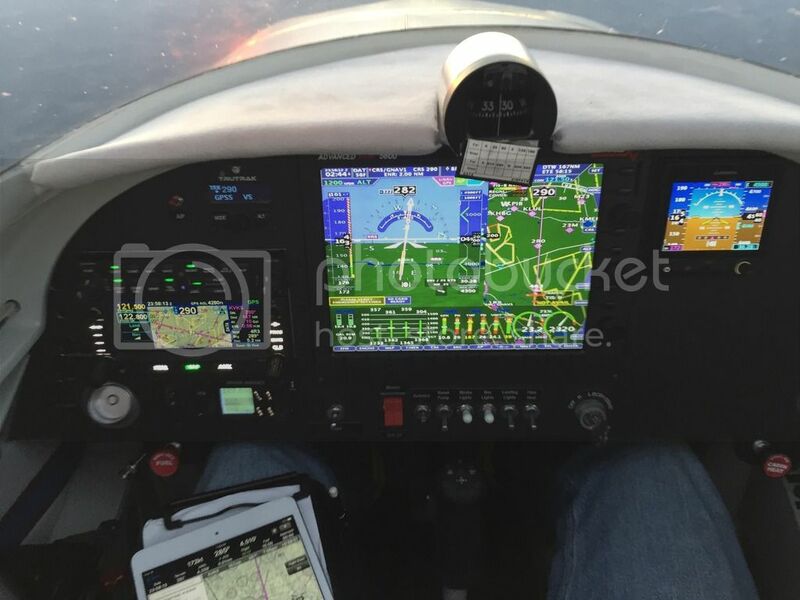 It looks like you have a very capable VFR setup (no apparent IFR NAV source, and although not required, only one COM?). 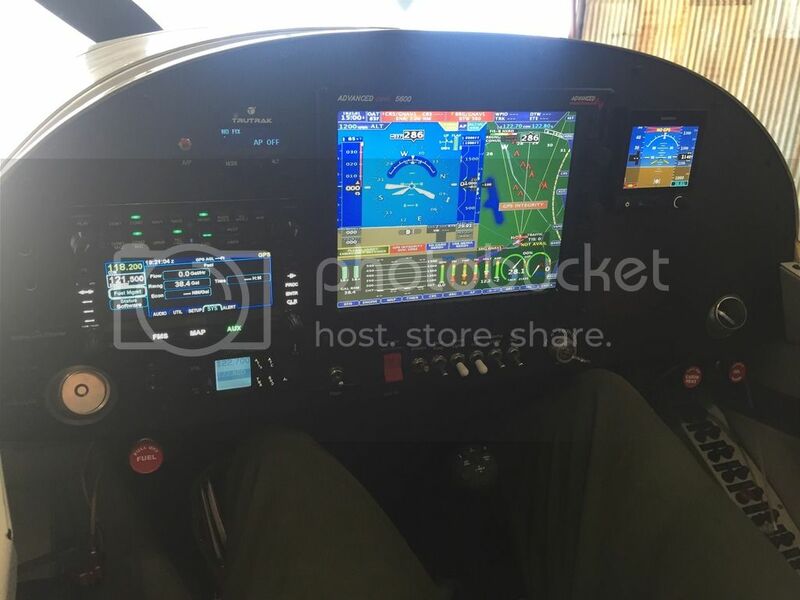 Exactly what I would done in a safe capable VFR modern airplane.. Congratulations! I loved my FB for several reasons. Aaron’s RV8 Fastback is the best thought out RV build I have seen. He gave me a tour the other day. Very impressive in many areas. Best I have seen. \r\nSimplicity is the ultimate sophistication. \r\nRV7 I0-360 C/S, Slider, AP, Glass, etc. sold. Nice job there. Just curious, where did you get the curved stick??. I adapted the RV14 stick from Tosten. It took some rework of the seat ramp. I had already cut out the panel as one of my tall guy mods. I just finished ripping out my all my old heavy steam gauges and re-designed and built the panel with a modular system. Using a hard mounted/powered iPad with quick release fasteners for ease of removal when desired. Powered by iLevil AHRS (with air data inputs) and a stratus backup AHRS. 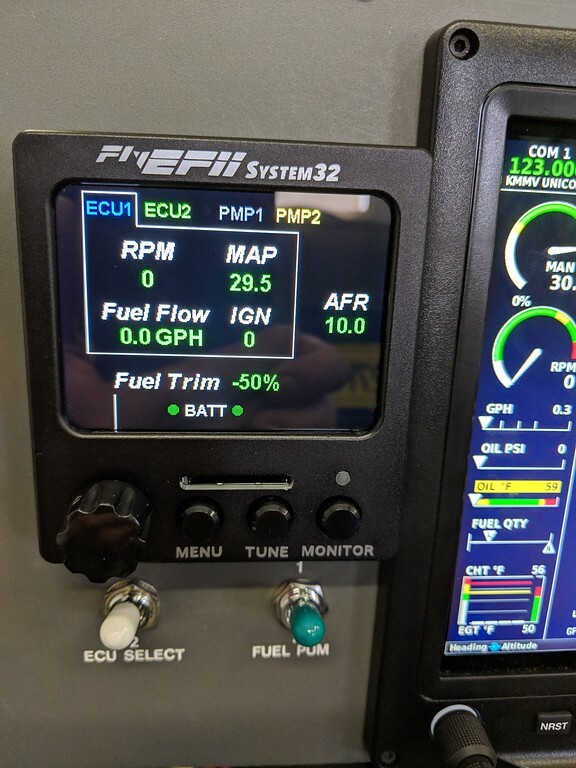 New Dynon D-10 EMS with all new plugs and custom push button start. USB chargers and music inputs installed as well. \r\nDo you have heat sinks on the back of your ipad? Fan? This seems interesting. Do you have heat sinks on the back of your ipad? Fan? This seems interesting. Not yet, though it\'s open. Still in the testing phase but I have yet to have an overheat condition on the iPad. 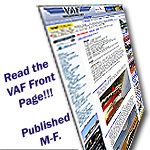 I made cover out of auto windshield material to put on it if I\'m leaving it in the sun. Again, no issues yet. If it\'s going to be baking in the sun all day the quick disconnect panel makes life easy. Here\'s our panel. We are about ready for a DAR. Just thought I\'d throw up a pic of my panel in progress. \r\nDrew up the panel in AutoCad and then had the blank cut with a water jet. \r\nWaiting patiently for my AFS 4500 Deck to slip in the big hole. \r\nStill need a 2-1/4" altimeter and compass. \r\nThis is the fun stuff to me. About to start wiring!! \r\nWill post more when the panel is completely populted.